We’re thrilled to welcome guest author Cindy Holby to the Junction on this fine Friday. 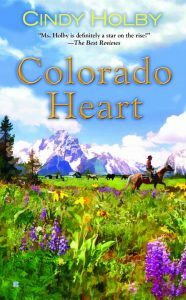 Cindy will give away a copy of her book, Colorado Heart, to one lucky poster. Thanks for joining us, Cindy! A few years ago, I was asked by Kate Seaver, an editor at Berkley, to write a historical western series. At that time I was really struggling, career wise. I’d been orphaned by Dorchester Publishing, where I’d written the Wind Series, a sweeping saga about the Duncan family that took place in 1880’s Wyoming. I had several irons in the fire, having written paranormal, futuristic and young adult, but my first love of writing had come from my western historicals and years of watching every western show or movie that came along. So, yes, I jumped right on that offer. My agent contacted me early Friday afternoon. I was kind of stunned, but said I’d get back to her. I had an errand to run and my mind was a bit preoccupied with the thought of creating a brand new series. I was also rather desperate for a contract. And that’s when Cade Gentry walked into my life. An idea formed for the hero and Cade was the first name that came to mind. Perfect. But he needed a last name. I live in a small town, population of around 2000. There’s a hardware store that’s been here for over a hundred years. Gentry’s hardware. Cade Gentry. His entire story came to me in the five minutes it took for me to drive through our tiny downtown area. You see Cade was desperate also. Desperate for a change in his life. He’s wounded and on the run from some terrible people because for once he did the right thing. Then he stumbles into a preacher’s campsite. I won’t tell you the rest of the story, because, hey, I want you to read it for yourself. I will tell you that Cade’s story is a story of faith. It also walks a rather delicate line between inspirational and romance. When recently editing Cade’s story for self publishing, I realized how much Cade’s quest for faith paralleled my own story, both when I wrote it, and now. Cade was stumbling about, making mistakes and thinking that God had forgotten about him. I felt the same way. I knew I had this gift for writing stories so why couldn’t I sell anything? I’d broken in with my Wind Series, fairly easily, selling off the slush pile with my first book and within a year of submission. Then after I was orphaned, I struggled. But just like Cade, God was telling me to wait, that my time would come and when it did, it would be perfect, because his timing always is. Although it’s very hard for us to realize it when we’re struggling. I’ve been struggling again. The past four years I haven’t written a complete book, although I’ve started several. My sales on my backlist are way down and I’m trying to figure out a way to pay the bills. But then I read Cade’s story again and realized that I had to hold on to my faith and believe that it will all work out in the end. God’s perfect timing. Cade’s story is titled Angel’s End. It’s about a funny little town tucked up in the mountains of Colorado. The town is built around a large statue of an angel with out-stretched arms and wings. No one knows how the statue got there, they just figured some fool tried to haul it to Oregon and realized they weren’t going to make it with such a heavy load and left it there, standing in a pleasant little valley with a windy creek and a gentle rise. 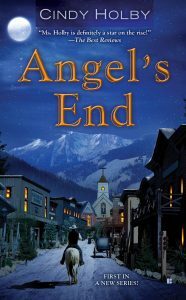 The perfect place for a town and colorful characters like Leah Findley, the sheriff’s widow, her son, Banks, Jake Reece, a rancher, Dusty, who owns a café called the Devil’s Table, and Ward Phillips, the mysterious owner of Heaven’s Gate, the local saloon. There’s also quite a menagerie of animals because I love them and work in rescue. So this is my story of how I came to create a town called Angel’s End. It’s a story of faith. 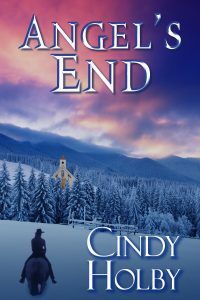 I will be giving away a print copy of Angel’s End and its sequel, Colorado Heart to one lucky reader. I hope the rest of you will pay a visit to my charming little town. 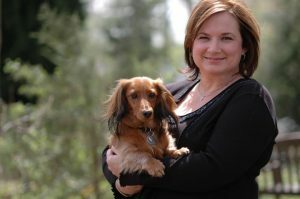 Award winning author Cindy Holby doesn’t let genre define her writing. She is published in historical, sci/fi, paranormal, dystopian, fantasy, and young adult. Her stories are character driven with action and adventure throughout. Reviewers note that her characters and plot blend flawlessly for well-rounded stories and hard-won happily ever afters. She takes us on an incredible journey of love, betrayal and the will to survive. Cindy Holby (writing as Colby Hodge) takes us on adventure at a breath-taking clip. She (writing as Kassy Tayler) writes with haunting precision and you’ll fall in love with her characters. Before her writing career took off, Cindy Holby held many jobs that ranged from bartending at a local disco to teaching first graders how to read. She lives in the foothills of North Carolina with her husband Rob, three rescue cats and a rescue dog named Riley. She is the proud mother of two sons who live close by. When she isn’t writing, she creates beautiful quilts and works in animal rescue. Readers can find her at http://www.cindyholby.com and on all social media outlets. What an uplifting backstory and view into your personal challenges. God Bless you. Cindy- Wow, I’m so intrigued. I love stories based on faith and I love my westerns, so to have both… Well let’s just say I’m sold. Thank you for coming and I’m so glad you shared your story with us. You have an amazing Holiday weekend. The books sounds really good. Thank you for sharing your personal struggle, as that makes me want to read your book even more to see what happens in Angel’s End. This sounds like an incredible new series. I love stories written in the west/southwest areas. I favorite is historical, but modern westerns are also fun reads. SOunds like a winning series and I love all the names of the places in Angel’s End. I can’t wait to meet the animals! This book sounds awesome. I’ve never read one of your books and would love the opportunity to read this one. I’m a virtual newbie to the reading world after decades of not reading I just started reading in November 2016 but I’m on my 133rd adventure! I disabled with MS with that and being a single mother on disabilty income it’s the only adventures I get. Great blog, I’m glad you joined us. There are two of my favorite places mentioned in the post. The Colorado mountains are special. It isn’t too far from the possible to have a large angel statue just there with no explanation. The small towns that popped up in those mountains are still populated with characters and a special atmosphere. The foothills of North Carolina are another special place. We live on the TN side of the BlueRidge Mountains and it is a lovely area. Since we are on the NC border, we spend much time on the other side. These mountains also have their own group of characters that aren’t all that hard to find. Our daughter has lived in NC for 25 years or so. Colorado was our happiest and healthiest place to live. We do go back when we get a chance. The spirit of the Old West is still alive there if you open yourself to it. Your story sounds amazing — and what a blessing it was there to remind you of your past lessons and give you encouragement for the present. Sharing this did for me – love those surprise encouragement nuggets! Your novels are captivating and special. What a wonderful post today which was uplifting. I so enjoyed learning about your life and writing which requires a great deal of perseverance and strength. Fascinating historicals. You are so incredible. Talented and creative and now a new novel series. I love the setting and historical Westerns are unique and meaningful. Colorado is beautiful for the locale as I have travelled there and it was memorable. Cindy you are an inspiration to any aspiring writer. Yes Gentry’s Hardware has been in our little town for at least a half century. I am proud to call you my friend and neighbor. I read the excerpts on these. They sound really good. I look forward to reading them. Your books sound really good and I would love to read them. Thank you for sharing your story.I’m looking forward to reading about Cade Gentry. Thanks for the giveaway opportunity. I really enjoyed this blog and bio of Cindy Holby. I think is a “gotta have” book. I love the inspiration and determination shown in stories like these. Cindy, I have enjoyed learning a little bit about you and your writing. I would love to read your books. Thank you for this opportunity.